The press watchdog has rejected a complaint by journalists against their own newspaper over its coverage of strike action taken by them. As reported by HTFP in December, National Union of Journalists members at the Cumberland News had taken the unprecedented action of submitting a complaint to the Independent Press Standards Organisation over the paper’s reporting of the dispute. But IPSO has now concluded its investigation into the matter and has sided with the News, stating that there is no “requirement for balance” in the Editors’ Code. Said IPSO: “The Code does not include a requirement for balance. However, there may be certain circumstances where a publication’s presentation of a particular subject, for example, through its decision to include certain pieces of information and omit others, may render the article misleading. This was not such a case. The story under complaint had reported that journalists employed by a number of local publications, including the News, had “decided to take industrial action in a dispute over pay” in the form of a one-day strike. Complaining under Clause 1 (Accuracy) of the Editors’ Code of Practice, the NUJ said that the mere reference to a “dispute over pay” did not identify the real reason for the strike, and therefore rendered the article misleading by omission. The union said a variety of factors had led to the journalists’ strike action – including the refusal of the local management to negotiate a pay claim submitted in January 2018, a reduction in the amount which journalists were able to claim in travel expenses, concerns over redundancies and staff resignations, and a failure to negotiate or discuss staff concern. 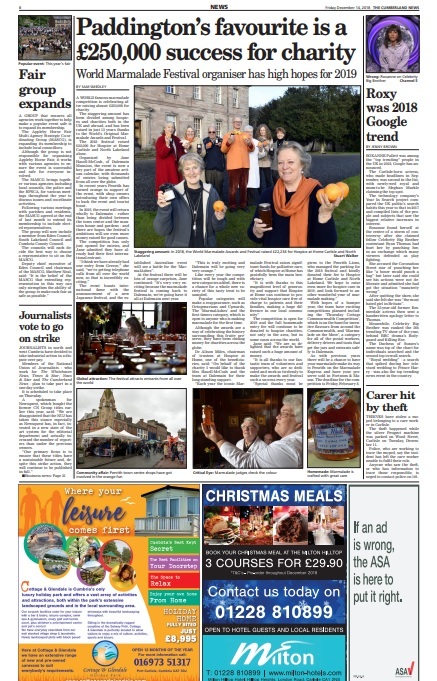 The NUJ further claimed that the inclusion of the Newsquest statement meant that the piece lacked balance and was misleading because referred to developments within Newsquest which were unrelated to the reason for the strike action, saying the News had failed to contact the union prior to publication or to include a comment from it in the article. Denying a breach of the Code, the paper said that the article was a short piece which accurately summarised the reason for the strike action as set out by the NUJ’s own description of it to its members on the ballot papers, a sample of which it provided to IPSO. IPSO found that the report did not represent a failure to take care over accuracy in circumstances where the story had been based on information which had been set out in the ballot papers sent to journalists, which explicitly stated that the various concerns raised related to pay. seems a strange one. No requirement for balance? Hmmm.